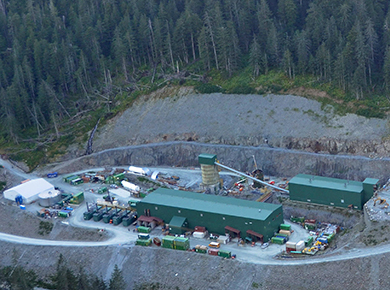 At Coeur Mining’s remote, off-grid Kensington Mine site about 45 miles north of Juneau, Alaska, access is limited to helicopter, float plane and boat. An established electrical grid is not available and a reliable power generation system is key for supporting the extensive job site infrastructure and accommodations for workers. To meet the prime power needs of the site, Kensington Gold Mine turned to Pacific Power Group for a solution that would provide reliable power and meet Alaska’s stringent emissions requirements. Our power generation team supplied six MTU Onsite Energy generator sets designed to supply 6100 kW of power and adequate reserves. The generators are the power utility for the entire mine’s operations, which primarily take place underground and require significant electrical power. One of the key factors in the selection of the gensets was the reliability of the MTU engines, which are trusted around the world to provide crucial utility power. Time before overhaul (TBO) for MTU Onsite Energy engines typically exceeds those of the competitors: those at the mine have a projected TBO of approximately 30,000 hours with the factory recommended service plan, providing increased uptime and a strong return on investment. Due to site emissions regulations and the isolated location of the mine, a unique engineering challenge had to be solved as Alaska required 90 percent reduction of NOx emissions. That’s typically easily achievable with a selective catalytic reduction (SCR) system. But SCR operation requires liquid urea, and the cost of regular shipments to the mine’s remote location would be exorbitantly high. Plus, the solution would have to be freeze protected due to the extreme Alaskan weather. An alternate solution would be to source, transport and store the urea in powdered form and mix it on site to provide the supply of emulsified urea. Unfortunately, at the time portable urea mixing plants were not available on the commercial market. To solve this problem, Pacific Power Group’s team designed, manufactured and installed a specialized mixing station in which powdered urea is mixed with de-ionized water to produce the necessary liquid urea – eliminating the high shipping costs. The system included a reverse osmosis water filtration system to supply de-ionized water and a 72 kW Inconel heater to bring the temperature to an adequate level to facilitate complete urea mixing. The process is completed with an automated system pumping the fluid into a heated storage tank. With the custom-built emissions solution from Pacific, Kensington Mine was able to meet the targeted 90 percent NOx reduction. Pacific Power Group continues to provide service onsite for the Alaskan mine, including preventative maintenance, predictive maintenance and repair work, along with all necessary engine overhauls.